If all goes according to plan, the city of Upper Arlington will hand over 9-1-1 dispatching services to the city of Columbus in early 2017. Officials in Upper Arlington have said the move would save their city as much as $600,000 annually. But there’s opposition to the plan by some UA residents. 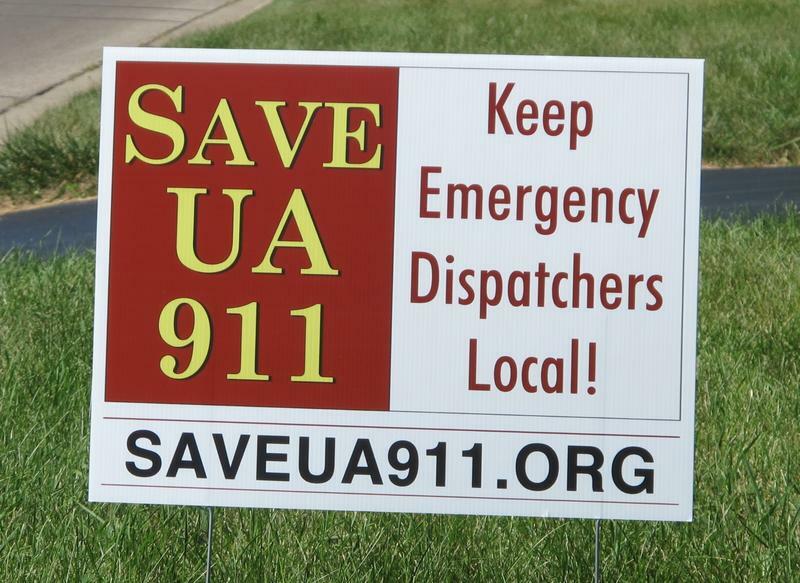 “Save UA 911” yard signs have sprung up all over Upper Arlington. Supporters want to keep their local 911 dispatching center in the city and not have calls outsourced to Columbus. “Sadly the city has a very clear idea of what they want to do but clearly it seems to be out of sync with what the community would like,” says Robert Foulk. Robert Foulk is working to keep the current dispatching system, which costs Upper Arlington about a million dollars a year. Foulk says if service was handled through Columbus, quality would suffer. “Our safety services are one of the reasons people move to or stay in Upper Arlington. It’s not just police and fire, our dispatching, in the way it works very closely and intimately with these two services really represents a system, that if you take a part of it away, it’s never going to function nearly as well as it does now,” Foulk says. But the city says the merger of 911 call centers is a national trend. “We’re seeing consolidation happen on a nationwide basis of 911 call centers,” says Dan Ralley. Dan Ralley, Upper Arlington’s assistant city manager, says the increasing expense of evolving technology makes outsourcing to Columbus a sound plan. He says more and more 911 calls are made from cell phones, and they already are answered by Columbus dispatchers. “You’re seeing jurisdictions say, ‘Well as the rise in cellular 911 calls occurs, we’re not able to receive those calls directly. And our technology costs are increasing on an annual basis.’ Consolidation makes sense in many cases,” Ralley says. But opponents to outsourcing are not convinced. They believe that critical response times will be substantially slower if calls are answered by Columbus dispatchers. “We have looked at numbers for Columbus where they are attempting to outsource it and in all regards, Columbus, for police dispatching, they are a minimum of four times slower than UA dispatching. UA is still four times faster in getting help on the way. From the time a call is picked up and taken until the time a unit is rolling,” Foulk says. “Add some technology that they’ve got available that we don’t and we think we’re actually going to enhance services,” Ralley says. And save several hundred thousand dollars annually says Ralley. “We get about 4,500 911 calls a year. That equates to one 911 call every two hours for a center that costs us a million dollars a year to operate. It gives you a sense of why we’re looking at this as a possible shared service,” Ralley says. But opponents worry that if calls are outsourced to Columbus they’ll be confronted by a time-consuming automated system, calls being placed on hold and that help will be delayed. Charlie Reed heads the Save UA 911 organization. “We firmly believe that response times are going to increase. Just the nature of a large call center, it’s a multistep process. And Upper Arlington is small and the call takers are the dispatchers. At a large center you have call takers separate from radio dispatchers. So right there is a two-step process when UA can make it a one step process, it’s very fast,” Reed says. The city manager’s office is currently negotiating a contract with Columbus for 911 services. The plan must be approved by the Upper Arlington city council. Charlie Reed thinks it’s just too soon to act. “There are way too many stones left unturned before we’re ready to sign on the dotted line on this contract. The fact that we’re in the eleventh hour, ready to sign the contract as a city before more of this information is put out and discussed is deeply disturbing,” Reed says. If outsourcing occurs, employees in Upper Arlington’s 911 center might be offered other employment or they might be laid off.